Our Wellhead are API certified with flanged ends. Our wellhead equipment ranges from sizes from 3,000 psi thru 15,000 psi. 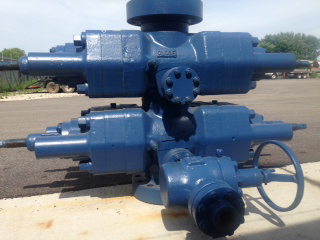 B&B Oilfield Equipment gate valves are API certified and are sized from 2 1/16” 5,000 psi thru 7 1/16” 15,000 psi. We offer a wide variety of sizes of studs and nuts, and we also have Teflon coated and stainless steel ring gaskets.